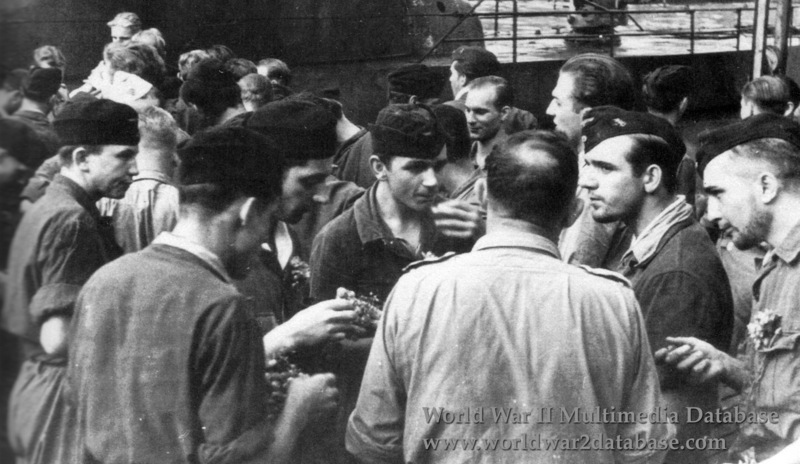 The crew of U-616 enjoys grapes after a successful patrol, probably on October 15, 1943, when U-616 returned to Toulon, France after sinking USS Buck (DD-420) on October 9 and HMS LCT-553 on October 11 in the Gulf of Salerno. U-616's commander, Oberleutnant zur See (later Kapitanleutnant) Siegfried Koitschka (August 6, 1917 - May 17, 2002) was awarded the Knight's Cross for sinking USS Buck. Successful U-Boat Commanders were presented with flowers from a German female auxiliary. U-616 fired a G7es Zaunkonig (Wren) T-5 torpedo, known as a GNAT (German Navy Acoustic Torpedo) to the Allies. This torpedo used passive sonar to acquire its target; after two U-Boats were sunk by their own G7es, U-Boats were required to dive and run silent to avoid their own weapon. The U-Boat crews knicknamed the G7es the "Zerstorerknacker" (destroyer cracker) because it was often employed against escorts. U-616 operated in the Mediterranean after the Allied landings in North Africa, where it had a number of unsuccessful patrols. Grossadmiral Karl Donitz (September 16, 1891 - December 24, 1980) disagreed with Reichsklanzler (Reichchancellor) Adolf Hitler's decision to send U-Boats to the Mediterranean and resisted this order. Nevertheless, sixty-two U-Boats were ordered to conduct combat patrols there; nine were sunk attempting to pass Gibraltar and ten others turned back with severe damage. All of the remaining boats, including U-616, were scuttled or sunk in combat and did not return from Toulon. U-616 was a Type VIIc boat, like most of the Mediterranean U-Boats. She was scuttled by her own crew on May 17, 1944 when she was attacked by seven United States Navy destroyers and a Royal Air Force Vickers Wellington from 36 Squadron. Over a three-day battle after U-616 attacked Convoy GUS-39, the Allied ships and aircraft caused severe damage to U-616. Her oil tank was leaking a trail behind the U-Boat. Out of fresh air, U-616 surfaced at 0807 Hours on May 17, her crew abandoned ship, and Koitschka ordered scuttling charges set off. U-616 sank ten miles (16 kilometers) off Douar el Behara, Algeria. Fifty-three crewmembers, including Koitschka, were saved. Five hours later, thirty survivors of U-616 were aboard USS Ellyson (DD-454) when she was attacked by U-960. The Allies immediately began to search for U-960, which was sunk on May 19, 1944.